January 2018 - this sustainable life. What I like the most about the concept of sustainability is its interconnectedness. 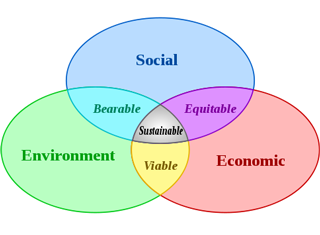 The illustration of the three pillars of sustainability shows this quite well. A system is only sustainable when all three (social, environmental and economic) pillars are strong. Thus, it is not only important to focus on the environment, but also on the economic and social elements of a system. However, most large organisations only focus on one pillar and no powerful international organisation covers the concept of sustainability as a whole. This is a large drawback as weakness in one of the other pillars can directly weaken the environmental pillar, as the financial crisis of 2008 has shown. Many environmental NGOs saw their income decrease and nations were postponing stricter environmental laws or investments. Besides the economic pillar also the social pillar is critical, as wars or poverty undermine the importance of the environmental dimension. Thus, a sustainable future can only exist if we strengthen all three pillars. 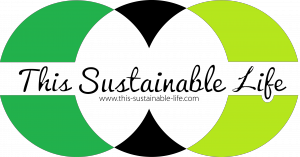 To illustrate this importance I also included the three dimensions of sustainability in my logo (shown as the three circles). The social, environmental and economic pillars of sustainability are hereby arranged in-line, since they are equally important. As the interconnectedness of sustainability fascinates me, I also want to cover all aspects of it in my blog: Starting with the social inequalities, to living a more eco-friendly life, to the importance of sustainable businesses and finally to one owns spirituality that makes one realize this interrelatedness.